Dr Maitiu O'Tuathail speaking after the meeting. 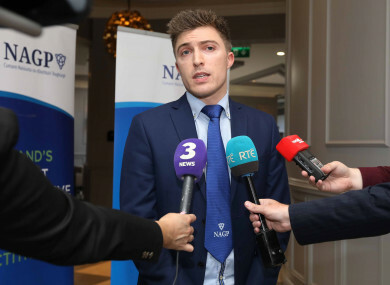 THE NATIONAL ASSOCIATION of General Practitioners (NAGP) have held an emergency meeting to discuss the outcome of the Eighth Amendment referendum, and passed motions calling for an “opt-in” provision for doctors to provide abortion services. The NAGP have also called for a conscientious objection provision to be inserted into any legislation passed by government in the wake of the referendum result. The association announced plans for the meeting last month, after the country voted by 66.4% to 33.6% to remove the amendment from the Constitution, paving the way for the legalisation of abortion in some circumstances. Dr Maitiu O’Tuathail, the president of the NAGP, said in a statement that the group wishes to be “fully involved as to inform potential legislation and service delivery in a doctor-led service”. The president also said that the Department of Health had not engaged with ordinary GPs as of yet on the issue. “Any new service delivery that is agreed will be delivered by ordinary Doctors to their Patients and not by academics and politicians,” Dr O’Tuathaill added. If this is not done properly it risks being yet another scandal in the health service in years to come. The three motions that were passed also included a request for Health Minister Simon Harris to clarify that he does not intend to make a termination of pregnancy service part of routine general practice. The NAGP also said that when a GP decides to opt in to provide a termination of pregnancy service, they must be given all the supports necessary such as access to ultrasound and access to counselling services. It also said that new ethical guidelines will be required for doctors from the Medical Council to cover conscientious objection and onwards referral of patients in this matter. Commenting on the matter on Twitter earlier today, Harris said that his department was already actively engaging with the Irish College of General Practitioners in drawing up clinical guidelines. Harris later said that doctors will always be able to opt out and conscientiously object, and that would be respected in the new law “but we repealed the eighth so we would care for women in our own country and that duty of care in terms of referral will definitely apply”. The expected legislation will allow terminations without restriction up to 12 weeks of pregnancy (most likely via abortion pills in the majority of cases) and in very limited circumstance thereafter, such as when the mother’s life is at risk, as outlined here. The NAGP, which has more than 2,000 members, said it has organised the meeting “to seek a consensus from our members on the issues surrounding the role that GPs might have, in the provision of services, following the recent referendum result”. The meeting was held in private “to enable an open and comprehensive debate among GPs”. Speaking ahead of the talks, a spokesperson for the NAGP said the association “respects the decision of the people in the referendum”. The NAGP previously said it is concerned that GPs don’t have the infrastructure to provide abortion services, adding that it wants to work with the Department of Health to “devise a respectful, safe and supportive pathway for women in crisis pregnancies”. “The women of Ireland deserve the best care and society must ensure this happens,” Dr O’Tuathail said last month. Harris previously said that GPs will be consulted before any legislative decisions are made in this regard. A spokesperson told us that the Department of Health has “held very productive meetings with the Royal College of Physicians, Institute of Obstetricians and Gynaecologists and the Irish College of General Practitioners to discuss the service issues that will arise from legislation to regulate termination of pregnancy”. “It was agreed to continue this engagement over the period ahead. “It is recognised that, separate to the engagement with doctors’ professional bodies, contractual discussions will also be required in due course in relation to the provision of services by GPs to GMS (General Medical Services) patients,” they added. Speaking after the referendum, Doctors for Choice said: “It is entirely possible, and preferred, that a doctor-led service can be established in Ireland. The numbers make this clear. If only 100 of the approximated 2,500 general practitioners in Ireland were willing to provide this service, each GP would deal with 26 requests a year, that’s one every two weeks. If 400 GPs were willing to provide this healthcare service, they would see an average of six to seven per year. Dr Marion Dyer, a member of Doctors for Choice and a GP based in Dublin with over 30 years of experience, told TheJournal.ie that abortion services must be available to women in their locality. Dyer noted that GPs are trained to carry out consultations with patients in a “non-directive way”. In general practice training what we teach young GPs to do, and what older GPs have been trained to do, is to listen to your patient, to try to understand their view of their circumstances and then to give good evidence-based information to the patient about the different outcomes if they take different courses of action. Dyer said there are “a very tiny number of women for whom an early medical abortion pill will carry extra health risks”, adding that such women will need to be referred on to an obstetrician for specialist care. Dyer said if there is any concern that the patient seeking a termination may be above the proposed 12-week limit, they will be referred to a specialist. “The vast majority can be looked after in general practice,” she added. The Irish Family Planning Association (IFPA), meanwhile, said concerns raised about the availability of crisis pregnancy counselling in the aftermath of the referendum are “unfounded”. Maura Leahy, IFPA Director of Counselling, said: “A national crisis pregnancy counselling service is in place and has been for many years. The IFPA operates 10 pregnancy counselling centres across the country, providing half of the SHCPP-funded crisis pregnancy counselling in Ireland. Women can make an appointment directly by calling the IFPA helpline (1850 49 50 51) or can get a referral from their GPs. “This is a specialist service, staffed by qualified and accredited counsellors who are experienced in crisis pregnancy and related issues,” Leahy said. Most women facing crisis pregnancy find that one counselling appointment is sufficient to enable them to make the best decision for them in their circumstances. Email “GPs group calls on Harris to ensure doctors must 'opt in' to provide abortion services”. Feedback on “GPs group calls on Harris to ensure doctors must 'opt in' to provide abortion services”.